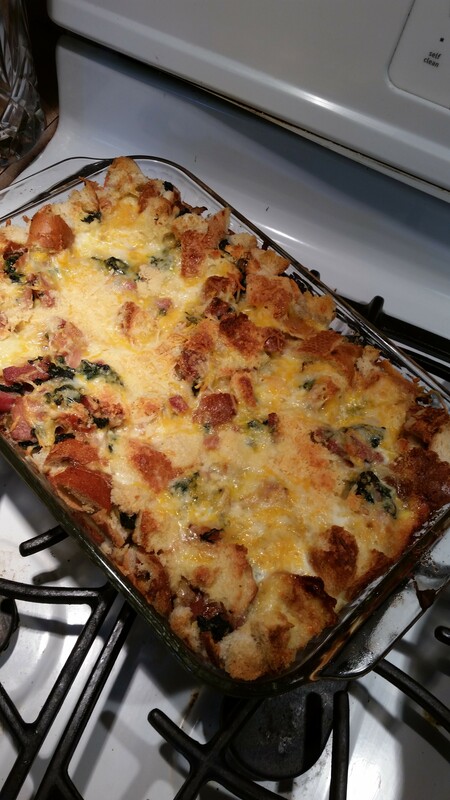 1-2 packages of frozen spinach or 1 cup cooked fresh spinach- I had some leftover creamed spinach which I used…my girls are not big spinach eaters, so I eased up on what I may normally make for myself. Melt the butter in a medium skillet over medium heat. Add the onions to the pan and cook until soft, about 5 minutes. Add salt, pepper, nutmeg, and continue to cook for 1 minute more. Stir in the spinach and ham. Stir to combine, remove from the heat, and set aside. Spray the inside of a 3 quart baking dish. 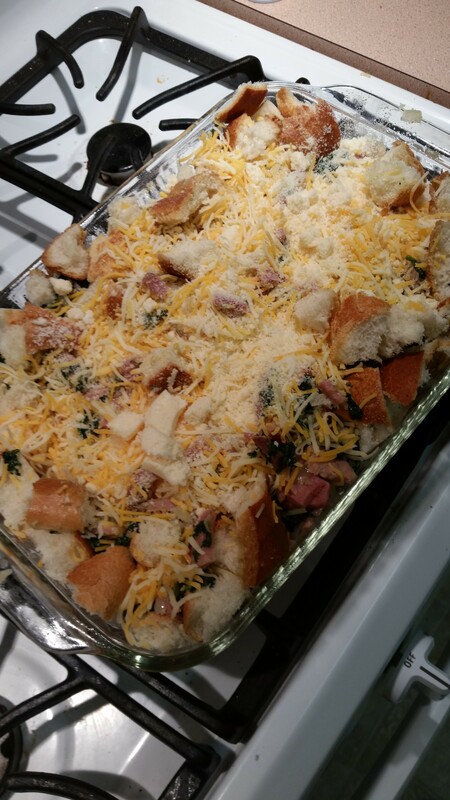 Layer the bottom of the dish with one third of the bread cubes. 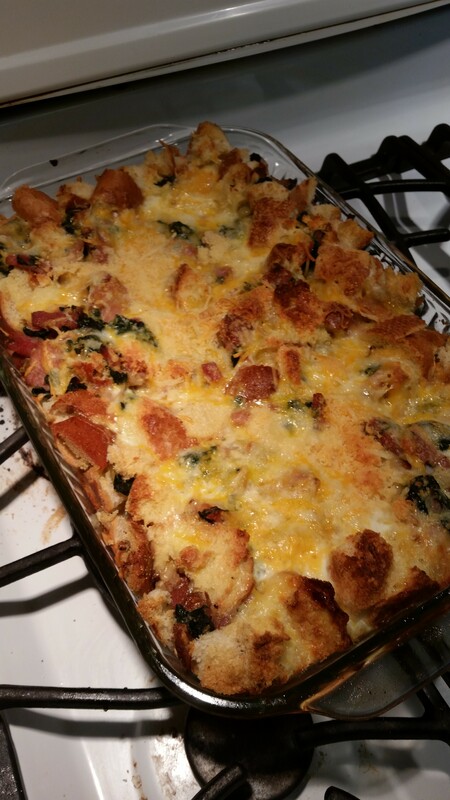 Top with one third of the spinach and ham mixture and one third of each of the cheeses. Repeat these layers with the remaining ingredients. In a medium bowl, combine the eggs, milk, the remaining ½ teaspoon of the salt and ¼ teaspoon of the pepper. Whisk together until blended. 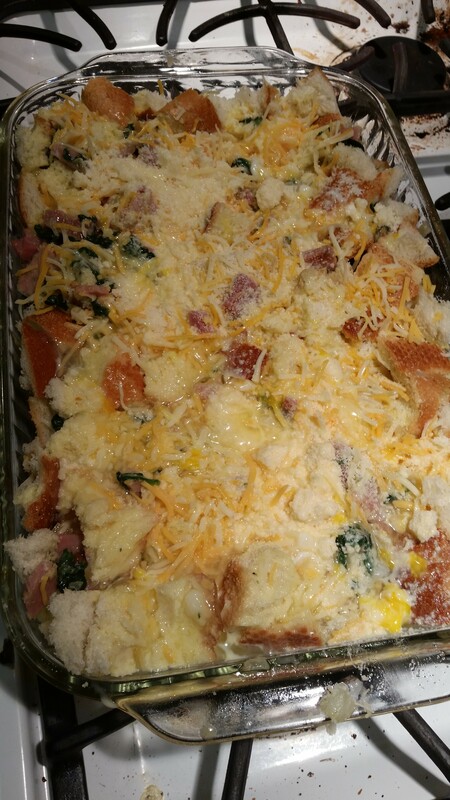 Pour the mixture evenly over the layered mixture in the baking dish. Cover with plastic wrap and chill overnight. Remove from the refrigerator 30 minutes before baking. Preheat the oven to 350˚ F. Bake uncovered until puffed, golden brown and cooked through about 45 minutes. Let stand at least 5 minutes before serving.